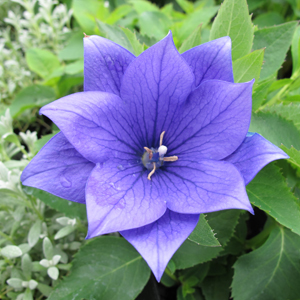 (Balloon Flower) Platycodon ‘Astra Double Blue’ is a wonderful new dwarf variety! ‘Astra’ Platycodons are a new series that form compact, well branched plants. The interesting balloon-like buds burst open into bell-shaped double flowers. The compact habit of ‘Astra Double Blue‘ also make it ideal for pots or mixed containers. Balloon Flowers are drought tolerant and make for great cut flowers. Don’t worry about the deer, they tend to stay away from this beauty.